Wendell Theodore Alley, I was born in Cedar Creek, Delta County, TX at the home of Dudley & Ethel (Kerbow) Robertson, his uncle & aunt. He was the second child of Edgar Lee Alley, Sr. & Florence (Kerbow) Alley. His older brother was Edgar Lee Alley, Jr. His mother died when his younger brother, Lawrence Elwin Alley, was born. His father died less than 2 years later & the 3 boys went to live with their uncle & aunt, Willie & Odie Alley & son, Morris. Wendell attended schools in Long Taw, Klondike, Liberty Grove & Cooper. In 1940, he went to Wyoming to a CC Camp*. In Feb. 1943, he joined the army 82nd Airborne. In Dec. 1943, he was shipped to ETO. In Europe he participated in 4 major battles, including Normandy & was awarded 4 bronze stars for those campaigns. After the war, he was shipped back to the states & he arrived at the separation center in Jefferson Barracks, MO, 21 Dec, 1945. He married Doris Lee (Toon) Wright in Feb, 1946 & they made their home in Delta Co, TX. Wendell was a rancher & horse trainer. He was an officer in the Delta County Rodeo Assoc. for many years. He also worked as a farm machinery mechanic several years & later drove a butane delivery truck. He was elected Delta County Justice of Peace & held that job 20 years. He died at his home in Hickory Grove, Delta Co, TX. 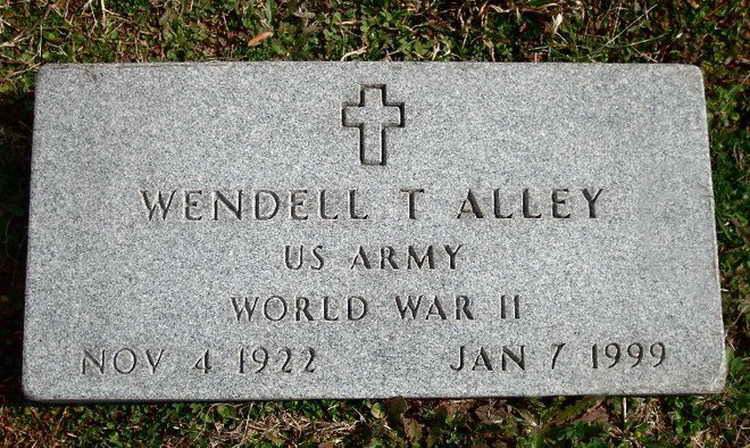 Grave marker for Wendell T. Alley in Plot #72, Space 2 of the Liberty Grove Cemetery, Liberty Grove (Delta county), Texas. In 1943 Pvt Alley was on Detached service during the Tennessee Maneuvers. with 2nd Army Maneuver #3 at Camp Forrest, TN. In March 1944, Pvt was on the Advanced Detail sent from Camp Cromore, Ireland to setup the new encampment in Nottingham, England. T/5 Alley appeared on the Service Company roster published with te company photo in Frankfurt, Germany in 1945.